The notes which accompanied this Telefunken LP, issued in the UK in conjunction with Decca, refer to the pianist Elena Glazunov as the composer's daughter. Elsewhere she is referred to as his step-daughter. Certainly there is room for confusion! In fact Glazunov got to know Elena as a pianist in the 1920s and subsequently married her mother, thus making the pianist his step-daughter. That he then formally adopted her technically makes both statements correct, though to imply any kind of blood relationship is to perhaps confuse the reader and blur the truth. The fact that Glazunov asked Elena to give the Paris première of his second concerto is perhaps more pertinent - he clearly held her pianistic abilities in great store, and one would assume that composer and player/daughter collaborated toa significant degree in preparing for that performance. How much Elena kept to the composer's intentions some thirty years later when making the present recording is of course impossible to know, but this is a rare opportunity to hear the interpretations of a composer's ideas by someone not only of great ability but also with a particular and unusual insight into the mind of the man. The recording here was generally well-made, if a little acoustically dead, and transferred from an excellent near-mint British Decca pressing from the early 1960s. It responded very well to XR remastering, which has lifted something of a dim veil from the original and brought it greatly to life. The pianist Elena Glazunov was originally Elena Gavrilova his step-daughter. He adopted her after marrying her mother. Elena performed the Second Concerto in Paris in December 1928. She also played it again at New York’s Met in December 1929 and during her tours of the USA that year with her step-father. 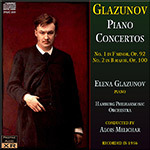 Alexander Glazunov composed his Piano Concerto No. 1 in 1911 during his tenure as director of the St. Petersburg Conservatoire. It is dedicated to Leopold Godowsky. It is in two movements, the second being a theme and variations. The Concerto has a nice line in rhetoric with some surgingingly heady invention. This boiling romantic cauldron seethes with aspiring strings and heroic pianism. It’s not all super-heated; at 10:30 onwards there’s some nicely measured and slow-pulsed calm. The closing pages are warmly curvaceous and rhetorical in the manner of the finale of the Eighth Symphony. It’s all to the good except for a strangely ‘dead’ yet assertive triangle. This is completely successful unlike the breathless Rachmilovich Glazunov 4 on Pristine PASC 109. The Second Piano Concerto is also high-flown, volatile and uber-romantic. It makes play with a theme familiar from The Nutcracker. The tempo is consistently slower than the low key Yablonskaya on Naxos 8.553928 and slower also than the ringingly resounding Alexeiev in No. 2 on Olympia OCD 165. Great impact! It’s all well worth it with a vibrant towering balance favouring the piano and Glazunov’s spirited playing. An analogue hiss-hush is present but nicely tamed. A few words about the conductor Alois Melichar (1896-1976). He was an Austrian who studied at the Vienna Academy of Music with Joseph Marx (1917-1920) and at the Hochschule für Musik in Berlin with Schreker (1920-1923). He was in the Caucasus from 1923 to 1926 where he gathered Caucasian folk songs. His music includes a symphonic poem, Der Dom (1934); Rhapsodie über ein schwedisches Volkslied (1939); Lustspiel-Ouvertüre (1942) as well as lieder and film music. This is a true representation of the best in Glazunov interpretation. No half measures.